TEN people have died of the fl u in the first nine days of this year, including four who had injections of the free anti-flu vaccine, as the Department of Health (衛生署) announced the start of the winter influenza season. The other six victims had not had vaccinations. The Centre for Health Protection (衛生防護中心) said that the percentage of seasonal influenza viruses among respiratory specimens that tested positive increased from 9.76 percent to more than 15 percent by 11 January. The overall admission rate with diagnosis of influenza in public hospitals also increased from 0.26 per 10,000 people to 0.40. By 10 January, 10 deaths had been recorded from influenza-associated illnesses. Seven of the victims were 65 or above. The other three were between 50 and 64. 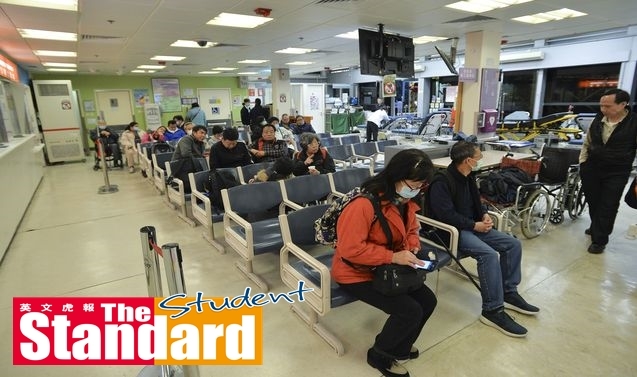 “The latest figures show that Hong Kong has officially entered the winter flu season,” Centre for Health Protection controller Wong Ka-hing (黃加慶) said. Wong said 75 percent of influenza viruses this year have been due to influenza B. The situation is similar in neighbouring regions of the mainland and Macau (澳門). While past studies have shown that influenza B infections are less severe than those of influenza A, Wong said the department will not take the situation lightly. Normally the winter surge lasts 16 weeks and so far the situation seems to be similar to previous winters, he said. “We will have to keep monitoring. It is too early to tell whether the situation will be more severe than last summer’s influenza season,” he said. Hong Kong saw an unusually fierce summer flu season last year when 431 people were killed, including three children. Wong urged the public to get vaccinated as soon as possible, and stressed that the circulating viruses in Hong Kong match the components of the northern hemisphere influenza vaccine adopted in the 2017-18 Government Vaccination Programme (政府防疫注射計劃) and Vaccination Subsidy Scheme (疫苗資助計劃). As of 7 January, about 647,000 people have been vaccinated under the two programmes. Influenza activity is expected to rise in the coming weeks, Wong said, but the government has prepared for it by stocking up on medication, including Tamiflu (特敏福), to meet demand. The Hospital Authority (醫院管理局) said all public hospitals in the city are prepared and ready for the winter fl u season.